The Keynesian Cross and solving for equilibrium (also known as the 45 degree line) - FreeEconHelp.com, Learning Economics... Solved! Sometimes you can be asked to find the equilibrium value from the Keynesian Cross or the 45 degree line. This means that we have to find the point where planned expenditures are equal to GDP by finding where the planned expenditure line (our C + I + G) is actually equal to the GDP in the economy. Sometimes these lines will not cross or be in equilibrium and this is due to the fact that inventories are either being built up or used up which will allow for discrepancies between C + I + G and actual GDP. 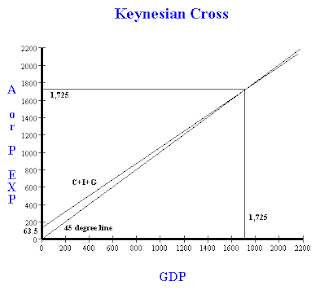 Please review a previous post on the construction of the Keynesian Cross (or 45 degree line) and how inventorieswork for more information. In an economy with no exports or imports, C = 0.94(DI) + 87; I = 15; G = 25; and T = 25. Taxes do not vary with the level of income. In addition, in this closed economy GDP = NI = PI. All figures are in billions. Find the level of equilibrium in the economy, i.e., when actual expenditures equal planned expenditures in the economy. While notation may vary from textbook to textbook or from class to class, generally C is consumption, I is investment, G is government spending, T is taxes, DI is disposable income (GDP – T), GDP is gross domestic product also commonly notated as Y, and NI/PI are national income and planned income respectively. Other books will call NI/PI aggregate expenditure and planned expenditure respectively. This means that if GDP is 1,725 we will be at the point where the two curves cross and therefore be at the economic equilibrium. This means that there is no change in business inventories (and investment). These equations are shown below in a graph. Because the marginal propensity to consume is so close to 1, the slope of the curves are pretty similar and that is why they are so close to each other. how did you get the 63.5 on y-axis?